Ok, after seeing the idea here, and following the chain here, and seeing it here, I think I have the best time/stress saving option for closing as off-topic. How about we put a checkbox in the close as off-topic dialog box that will let you input a comment (as if you had flagged other), and then after you hit the vote-to-close button it will auto-flag it other with your comment? Of course, this checkbox would be radio box option with the other five, so it couldn't be chosen simultaneous with any of those, and of course, you could still not choose it and just close as the generic off-topic. This will save clicking out of the dialog, and then having to click into the flag dialog. Edit: For those who think the process should be slow to discourage migrations, I'd like to point out that that isn't a real solution. If we have a problem with migrations (which I would argue against) then solve that problem, don't make the site slower to discourage that. Selecting an option and entering text into a field feels like going forward, in contrast to the back or cancel-and-flag steps required otherwise. Going forward feels like one did the right thing, whereas having to go back feels like having made an error. This approach also reduces the number of clicks required to get this flagged properly. Having only to enter the name of the target site, instead of a full sentence, caters for lazybusy people. And once moderators recognize the boilerplate text added to such a request, the'll skip it when reading as well. Migrations are meant to be for that rare gem of a question that is off topic $here and has a better home $elsewhere. In practice though it is largely used as a way of (with the best possible intentions) throwing any old question over the fence so it becomes somebody else's problem. Quality and topicality (as measured by those participating $elsewhere) are rarely taken into consideration - this is why for example Server Fault is nolonger a migration target for Stack Overflow. Some people have even been known to just vote-to-close the same way as everyone else because $elsewhere seems like the place to send stuff now that other targets aren't available. Your question is off topic for Server Fault because it doesn't appear to relate to servers/networking or desktop infrastructure in a professional environment. It may be on topic for Super User but please search their site for similar questions that may already have the answer you're looking for. I modify it slightly depending on context but note that it says why a question is off topic, where it may be on topic and also points the OP to the /search function. If after searching $elsewhere the OP can't find an answer then it's fairly painless for them to copy+paste their question to the other site. To some extent this also educates the OP as they learn that there are other SE sites and (hopefully) how to use search. This is not a good idea - it will be abused. I agree with Lance Roberts that we do have an issue here and with MvGs proposed compromise solution. SO rules say that users should come to the site with a particular problem or question that can be answered with factual (and not opinion-based) information. So, when someone comes with "look at my code / can it be improved" questions, they're deemed off-topic. These particular type of questions would, however, fit nicely into CodeReview criteria, but there's no direct (and easy) way to suggest such migration through the flagging system. Many inexperienced users (including myself less than a year ago) would simply repost the question on CodeReview. Such action would very likely to get them blamed for cross-posting. Some new users can also be concerned with loosing their reputation gain if they are to simply delete the original question with existing up-votes and post it on a different site (from scratch). Not the answer you're looking for? 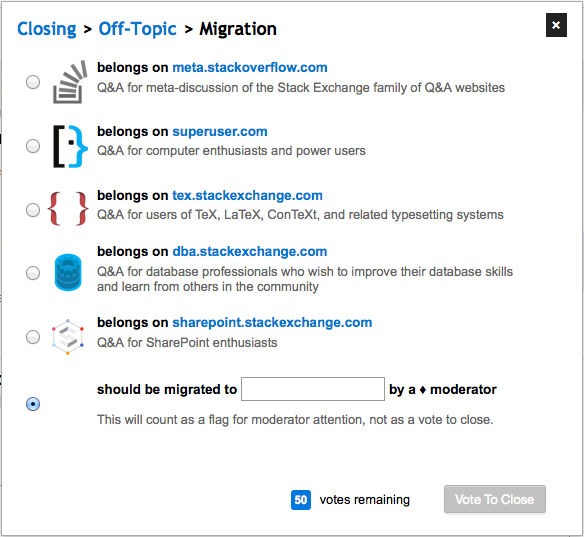 Browse other questions tagged feature-request flags migration vote-to-close off-topic . How to pass a question from stackoverflow to programmers.stackexchange? Should the 'close as off-topic' menu provide a write-in option for the alternative site?